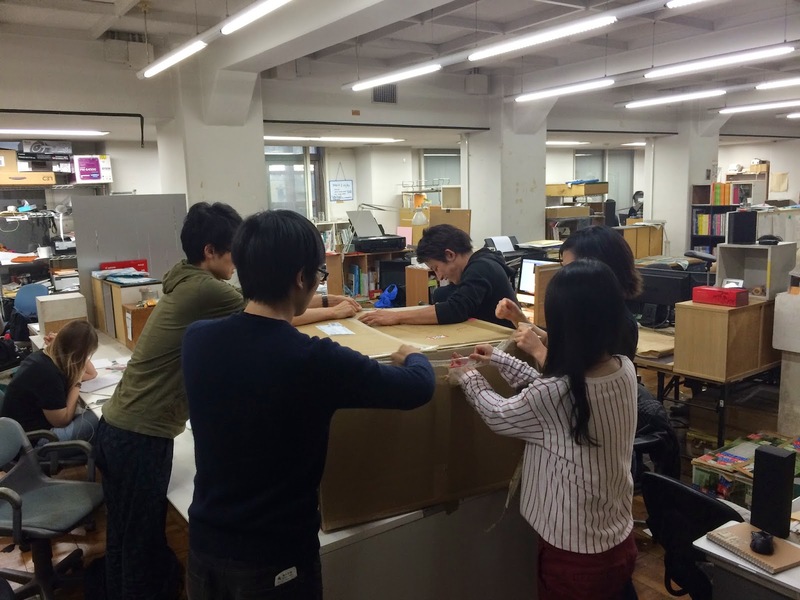 Design kick off meeting with Prof. Kengo Kuma at KKAA Office. We brought 8 preliminary design options to discuss with him. Through the discussion we selected a few volumetric options to develop further. 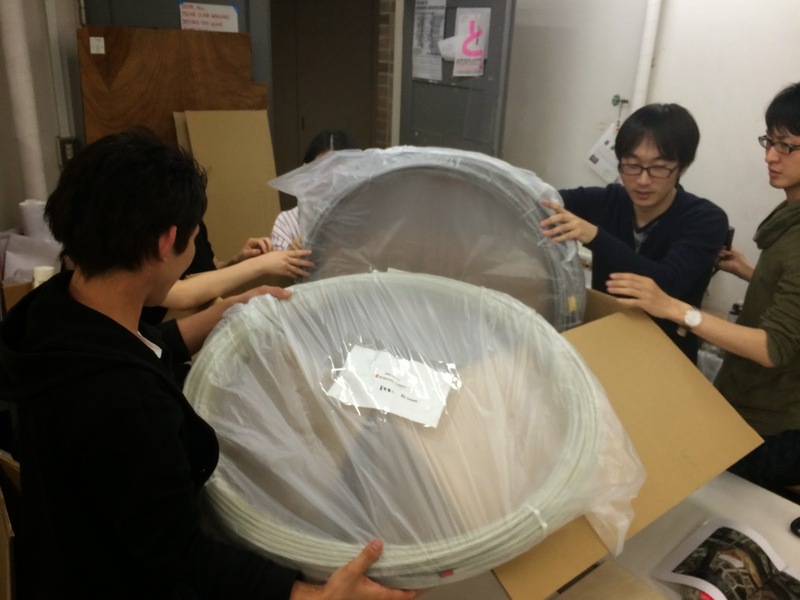 We received the material for the 2015 SPL Pavilion. The material is a carbon fiber rod from Komatsu Seiren. We tested the structural properties of the material with Prof. Jun Sato. Professor Jun Sato gave a comprehensive structures lecture for the first year students. He showed the students many renowned projects and experiments that has pushed the boundaries of structural engineering possibilities. After which, each student team conducted a bending moment test and Prof. Sato advised them on calculations, further tests, and possible improvements. In the future, these collaborators and experts will join us as jury members to select the final design for this year's 2015 DFL research pavilion. Arduino Workshop | Making "Smart Tools"
On April 10th, we had an Arduino workshop and invited Yuta Sugiura from Keio University. The goal of the workshop was to build "smart tools" in just an hour. Students making their own "smart tools"
Mounting circuits on the "smart tool"
At the end of the workshop, we had presentations. Interactive washing puff - it measures the distance between the machine and a wall. It also measures worker stress by measuring the loudness of workers' voices. Smart spray for grafitti artists - this enables the painter to create a brush-like feeling by controlling the discharge rate (depending on the distance between the wall and the spray). Smart detergent dispenser - it detects dirt by checking the brightness of the wall. Mika Araki from Jun Sato Lab gave the first lecture in a lecture series on structural engineering for the first year students. She showed the students how to conduct various material tests, but focused on bending in this lecture. Each project has its own material properties relevant to design, and thus, it is important to listen and learn from the experts. In the future, these experts who we invite for lectures will join us as jury members to select the final design for this year's 2015 DFL research pavilion. On April 1st, we had the first presentation for the 2015 SPL pavilion. The research group, composed of PhD and master students from Kuma lab, Chiba lab, and Jun Sato lab, presented in Obuchi lab. The topic of the presentation was woven architecture featuring carbon fiber rods.